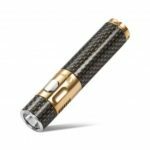 Lumintop Elfin is a luxury gift flashlight with its perfect handy size and eye-catching dazzle color. 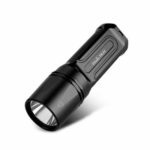 As its name Elfin, this little flashlight brings surprises of its glossy surface, for the changeable color of the flashlight in different view. 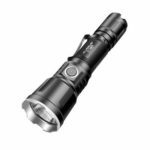 Optimized ultra-precise reflector and double-side AR coated lens which resists impact and thermal shock, offer a more comfortable cool beam of Cree XP-L V5 LED. Using a single CR123A (or RCR123) battery could approach 4 useful modes for common use. 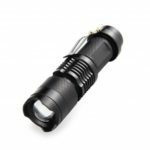 The comfortable clicky tail switch is very convenient for one-hand operation, and easily to recognize in the dark through tritium in the tail button. 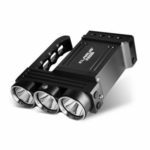 Utilizes Cree XP-L V5 LED with 50,000hour lifetime. 4 output modes with max. runtime of 25 days. Precision micro-textured reflector creates smooth, optimized beam. Double-side AR coated, tempered glass lens resists impact and thermal shock, maximizes light transmission 99%. Boasts a peak beam intensity of 1930cd and a throw distance of up to 87 meters. Stainless steel body decorated with gold-plating flame figure. Intelligent advanced temperature regulation system allows it to adjust output performance according to its body temperature to ensure stable and safe operation. Runs on 1 x CR123A or 1 x RCR123 battery (batteries not included). tail cap can stand and be used as a candle. Impact resistance to 1.5 meters and waterproof in accordance with IPX8 (submersible to 2 meters). Operation: Click the tail cap switch to change the model moonlight-low-mid-high. 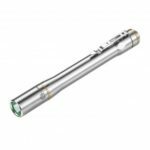 Please Note: This Lumintop Elfin LED flashlight varies in 2 different versions, the model 02 comes with a tritium tube and model 01 without.